Whether you’re a fan of the Eurovision Song Contest or not, it’s hard to downplay the strength of a competition that has held the attention of a continent for nearly 60 years. More than 1,000 songs have been entered in the battle to date and every year an estimated 125 million people from across Europe and beyond tune in to watch as 26 countries fight it out to be named the winner. The popularity of the contest is undeniable. But what can the business world learn from a contest that has gripped the hearts of a nation for so long? We’ve conducted some analysis around previous Eurovision Song Contests and have found the below to be key ingredients for success in the competition. The Scandinavian countries have been the most successful combination to date – winning the competition a massive 11 times between them. Whether this is due to a knack between the countries for working together, or because they’ve mastered the art of a catchy tune, it’s hard to tell, but we are seeing this Scandinavian success replicated in the business world. Whether it’s for flat packed furniture (IKEA), sharing music (Spotify) or getting us addicted with Angry Birds (Rovio) – Scandinavian countries are topping the business charts too. We found that participating countries often work together to vote for their neighbours. Take the UK for example. The British public still have a tendency to vote for their closest neighbouring countries and, over the years, have given the most points to Ireland, France, Austria, Belgium and Switzerland. Further to this, Russia gets a lot of support from its neighbouring countries – Estonia, Latvia, Belarus and the Ukraine have awarded the country the most points since it joined the contest in 1994. And this backing doesn’t go unreciprocated. The Russian audience itself favours the Ukraine above all other countries, awarding it an average of ten points each year. This collaboration is something that should be rife in any workplace. Unlike countries in Eurovision, businesses are still struggling to hone their skills when it comes to working together, in spite of the fact that collaboration has been proven to increase employee productivity. One study has shown that some companies see project cycle times reduced by as much as 30% with effective collaboration. While the odd ballad, like ‘Let Our Love Shine a Light’ slips through to Eurovision success, it’s the room filling, upbeat crowd pleasers, such as last year’s ‘Euphoria’ or past hits like ‘Making Your Mind Up’, ‘Waterloo’, ’Diva’ or ‘Fairytale’ that go down well in the competition. If you can try to find the positive out of the negative, then not only does this help you in the long run, but ultimately helps you to nurture a more enthusiastic workforce. If you want your song to be a success, make sure you stand out. 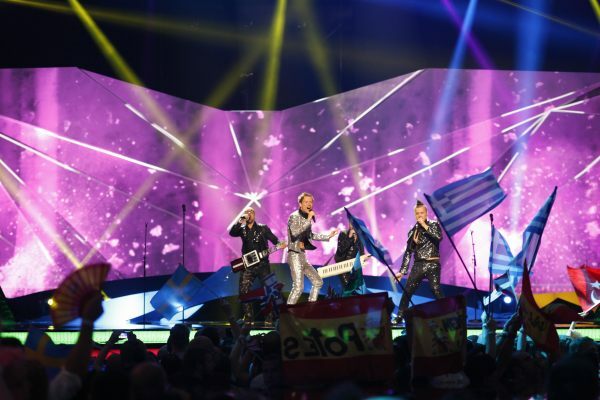 Most people remember Finland’s winning entry, ‘Hard Rock Hallelujah’ from a couple of years ago – the Satanic theme stood out from the typical Eurovision entry. Similarly, you’d be hard-pushed to find someone who didn’t remember the ladies in Bucks Fizz having their skirts ripped off and the Russian ‘Grannies’ from last year are probably 2012’s most memorable act. This one should really go without saying. If you want your business to be a success, you need to find your unique selling point. Whether this is through the functionality or innovation of your product, its ease of use or your wonderful customer experience, then you need something to set you apart and get you noticed among your competitors and, more importantly, your customers and prospects. Although the song contest was initially designed to showcase music within different nationalities, the songs that perform the best are those that can be related to by as many people as possible. Whether this is by using familiar words such as ‘I can, I will’ or ‘J’aime’, previous winners have been songs where the meaning is easy to understand in other languages. In business, you need to make sure that your offer is accessible to as many people as possible, whether this is by making your website available in a number of languages if you have an international offering, or by making your product as usable as possible.